Another sleepy Sunday for shows that didn’t have NFL help. FOX: The network had the late national NFL game, and consequently THE SIMPSONS rose to a preliminary 2.8, BROOKLYN NINE-NINE was up 0.7 to 2.1, the first new FAMILY GUY in some time was at 2.2, and BOB’S BURGERS increased by 0.6 to 1.6. ABC: ONCE UPON A TIME lost 0.1 to 2.0, but RESURRECTION climbed 0.1 to 1.0 and REVENGE increased 0.2 to 1.2. The night started with AMERICA’S FUNNIEST HOME VIDEOS up 0.1 to 1.3. NBC: SUNDAY NIGHT FOOTBALL is currently at 6.1, up 0.2 from last week’s early number. ABC’s non-DANCING WITH THE STARS show tonight is THE GREAT CHRISTMAS LIGHT FIGHT. 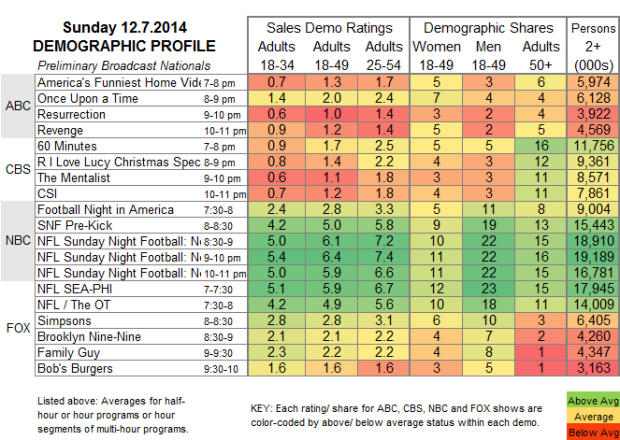 FOX is in reruns, but NBC’s STATE OF AFFAIRS will have to deal with fresh competition on both ABC and CBS. On cable, ABCFamily features special Christmas episodes of its hiatusing series.